That's the finding of research analysing the names of authors listed on millions of scientific papers. 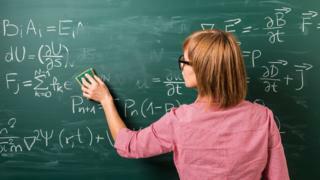 Physics, computer science, maths and chemistry had the fewest women, while nursing and midwifery had the most. Without further interventions, the gender gap is likely to persist for generations, said scientists from the University of Melbourne. "Of the gender-biased disciplines, almost all are moving towards parity, though some are predicted to take decades or even centuries to reach it," said Dr Cindy Hauser. The researchers used computer methods to analyse the genders of authors listed in databases (PubMed and ArXiv) containing thousands of scientific papers published over the past 15 years. They found that 87 of the 115 subjects examined had fewer than 45% women authors. Women are increasingly working in male-biased fields such as physics (17% women), while men are increasingly working in female-biased fields such as nursing (75% women). However, forecasts suggest it will take a very long time to close the gender gap in some fields, with predictions of 320 years for nursing, 280 years for computer science, 258 years for physics and 60 years for mathematics. Equal access to informal professional networks. "The solutions are out there but it's difficult to bring about change and get people to act on them," said Dr Luke Holman. "We haven't acted on them enough because it's difficult to change the way that people have always done things and it's maybe not afforded as high a priority as it should be by people in positions of power in the scientific industry and academia." The researchers also looked at variation across countries. They found a larger gender gap in Japan, Germany and Switzerland and a smaller gender gap in some European, African and South American countries. The research is published in the journal PLOS Biology.